Pakistan, a country in South Asia bordered by Afghanistan, Iran, India, China, Arabian Sea, and the Gulf of Oman has a total land area of 307,374 square miles and a population of over 170 million. 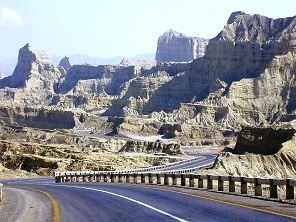 Pakistan, which extends from the Arabian Sea to the Karakoram includes all sorts of terrain – mountains, plains, deserts, forests, hills, and plateaus. The ethnicity, and the flora and fauna keeps pace with this geographical diversity. A nuclear, Muslim country it has strategic alliance with US and China and these partnerships has allowed it to be a semi-industrialized economy. Its economy has shifted from being agriculture based to being service based. Its major challenges are in combating terrorism, poverty, and corruption. The best time to visit Pakistan is November through April. Mohenjo-daro, Harappa nad Taxila are the major tourist attractions. Pakistan cuisine borrows heavily from North Indian cuisine and is very spicy. Lonely Planet Pakistan and the Karakoram Highway 978-1741045420 $24 Best Travel Guide for Pakistan! A 70-page traveler’s introduction followed by sections on Islamabad and Rawalpindi, Pubjab, Balochistan, Sindh, Azad Jammu and Kashmir, and the Karakoram Highway. Three Cups of Tea: One Man’s Mission to Promote Peace…One School at a Time 978-0143038252 $9 A biographical work of Greg Mortenson, and American nurse who devoted his life to building schools in remote areas of Pakistan, following a failed attempt the scale K2, the world’s second highest peak. Pakistan Nelles Map 978-3865742537 $12 1:1,500,000 Scale. Insets include city maps of Karachi, Lahore, and Peshawar. The first stamps of Pakistan were a long set of twenty stamps released on October 1, 1947 that were ‘Pakistan’ overprints on stamps of India during the period from 1937 to 1943. The set (Scott #1 to #19) catalogs for around $170 MNH and around $155 used. The designs show King George V (KGV) and an airplane with KGV in the inset. The first original issues of Pakistan were a set of four stamps released on July 9, 1948 showing local scenes and symbols. The set (Scott #20 to #23) is remarkably inexpensive cataloging for around $4 MNH and around a dollar for used. The designs show Constituent Assembly Building in Karachi, Karachi Airport Entrance, Lahore Fort Gateway, and Crescent and Urdu Inscription. Pakistan gained independence from the United Kingdom on August 14, 1947. Pakistan issued a long set of twenty stamps between 1942 and 1957 showing local scenes. The set (Scott #24 to #43) is sought after and very valuable cataloging for around $140 MNH and around $100 used. The designs show scales, star, and crescent, star and crescent, Karachi Airport Building, Karachi Port Authority Building, Khyber Pass, Ghulan Muhammed Dam, Indus River in Sind, and Salimullah Hostel. A similar set of eight stamps (Scott #47 to #54) is also sought after and collectible cataloging for around $80 MNH and around $7 used. A set of seven stamps released on August 14, 1954 to mark the seventh anniversary of Independence. The set (Scott #66 to #72) catalogs for around $20 MNH and around $5 used. The designs show Kaghan Valley, Gilgit Mountains, Badshahi Mosque in Lahore, Emperor Jahangir’s Mausoleum in Lahore, Tea Garden in East Pakistan, Cotton Field, and River Craft and Jute Field. A set of three stamps issued on December 25, 1965 to honor the Pakistani Armed Forces. The set (Scott #219 to #221) catalogs for around $7 MNH and less than a dollar for used. The designs show tanks, Army emblem, and soldier, Navy emblem, Corvette No. O204 and officer, Air Force emblem, and two F-104 Starfighters and pilot. This was followed on February 13, 1966 by another issue in a similar theme to mark the Armed Forces day. That stamp (Scott #222) catalogs for less than a dollar MNH and a few cents for used. Pakistan’s army is the seventh-largest in the world and is the only Muslim majority nation to possess nuclear weapons. Military presidents have ruled the country from 1958 to 1971, 1977 to 1988, and 1999 to 2008. Currently, it is a democratic parliamentary federal republic with Islam as the state religion. The military has engaged in two major wars with India in 1965 and 1971. A set of five stamps released on February 29, 1976 showing a view of Mohenjo-Daro excavations. The set (Scott #395 to #399) catalogs for around $7 MNH or used. The set was issued to mark the UNESCO campaign to save Mohenjo-Daro excavations. Mohenjo-daro was one of largest city-settlements in the Indus Valley Civilization that dates back to before 2600 BC era. The archaeological remains of the city is a designated UNESCO World Heritage Site. Ruins of Harappa and Taxila are other prominent archaeological sites. A set of six stamps released on August 14, 1989 to mark the 42nd anniversary of Independence Day. The set (Scott #712 to #717) catalogs for around $8 MNH and around two dollars for used. The design shows a portrait of Mohammed Ali Jinnah. There is a variety of the same set with the overprint “National Seminar on Philately Multan 1992” that was available for sale only at the seminar. The set catalogs for around $125 - forgeries abound. Mohammed Ali Jinnah is considered as the founder of Pakistan and is known in Pakistan as the Father of the Nation. The first coin of Pakistan was an Islamic Republic Standard Coinage (3 Pies = 1 Pice, 4 Pice = 1 Anna, 16 Annas = 1 Rupee) Bronze Pice issued in 1948. The issue has very high mintage (over 100M) and catalogs for less than two dollars in UNC. The design shows Legend around center hole in Obverse and Crescent and Star divides value around the top, center hole dividing date in Reverse. Pakistan has issued a small number of gold coins and proofs over the years starting with the 100th Anniversary of the Birth of Mohammad Ali Jinnah of 1976. The issues have low mintage (few 100s) but are still valued only at a slight premium over bullion value. Coins $1 and up Common UNCs start around $1. High Grade (XF+) Rupee Coinage from the 1940s starts around $10. UNC Anniversary Proofs, Trial Prints from the 2000s, High Value Silver UNCs from the 1970s, etc starts around $50. Commemorative Silver Proofs and Gold Coins go well into the 100s. Paper Money $1 and up Common UNCs starts around $1. Fancy Serial Numbers, Replacement Banknotes, etc starts around $15. Recent Banknotes with severe color variation errors, ink over-runs, etc starts around $50. UNC Bundles, Issues with cutting errors, Very low serial numbers, etc go well into the 100s. Jewelry, mangoes, dry fruits, ethnic wear like salwar kameez, khussa, footwear, and tops, rugs and wollen items are the main souvenirs from Pakistan. Art $5 and up 19th century historically relevant and local scenes photos and prints start around $5. Vintage original photos go well into the 50s. Antiques $10 and up 19th century maps start around $10. Bokhara Kazak Rugs, Multan Silver Enamel Amulets, etc start around $50 and go well into the 100s and 1000s. Gemstones $2 and up Peridot stones start around $2. Larger VVF stones go into the 100s. and 1000s. Miscellaneous Collectibles $10 and up Tourmaline, Topaz, Spessartite etc crystals start around $10. Republic Medals, Applied Cushion Covers, etc start around $20. Large mineral specimens, Handmade Cobra Swords, etc go into the 100s.